How do you achieve proven results and peace of mind? We're here to create advanced products that incorporate sophisticated chemistry, convenient application techniques and leading edge research. Solid results begin with our advanced technology. LandLoc Environmental Products seamlessly bind elements together to outperform when it comes to wind and water erosion, soil and sub-base stabilization and pad construction. This innovative technology allows you to get the job done, and done right, all while reducing your ecological footprint. Simple, safe and sustainable, our products are the ultimate in soil stabilization and dust abatement on the market today. While our solutions are designed to deal with the most complicated soil stabilization issues, our products are easy to use and cost effective. 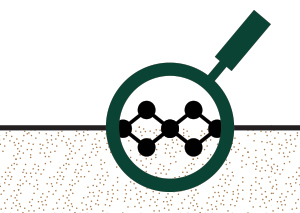 All LandLoc Environmental products use proven long-chain nano-technology to form complex bonds at the microscopic level. When applied to a surface, our products extend into the soil or aggregate, binding the soil particles together to form a strong and durable, environmentally sensitive barrier. Once cured, our products form a clear, flexible layer of protection that is permeable enough for air and water, yet tough enough to withstand the harshest of conditions from heavy construction traffic to Canada’s extreme weather. There’s no stronger bond—or better solution available —and certainly not one that is as easy to use and apply.